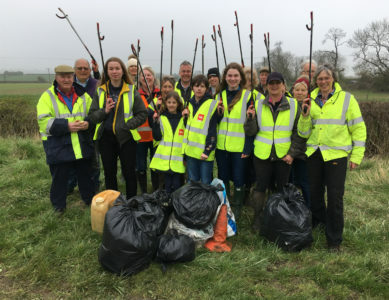 Last year’s Rural Spring Clean was so successful that the Countryside Alliance were delighted to become community partners of the Great British Spring Clean, which is taking place between 22 March and 23 April. As the biggest mass-action environmental campaign of its type, the CA where keen to get behind the event and support it in any way that it could. Over 50 clean up events where organised by our members, all of which were prepared to muck in (or muck out as the case may be) to clean up the countryside which is so loved by us all. It is in instances like these where we see the best of our members. Communities coming together to make an impact in their local area which will be noticed and appreciated by so many. There is little glamour in such a task, though our members injected as much as they could, but the result of a cleaner countryside is priceless. Footpaths, river banks, fields and roadsides where all swept clean by teams of people doing their part in keeping animals safe and Britain looking at its best. Improving the environment on their door step, by taking just a few hours to pick up what other have left behind. Events like these are vital to keeping the countryside a place for everyone to enjoy. Those who took part should be celebrated for doing their bit in preserving these spaces. To keep our countryside ‘summer ready’ you can still get involved with the Great British spring clean here , joining the other 535,890 people who will be #LitterHeroes and join the fight against litter.